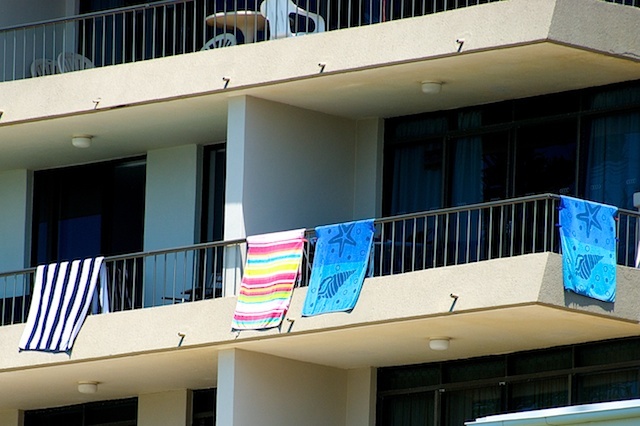 Long term browsers of this blog may recall that I like to record the first towel-over-balcony rail of summer. This year I missed for reasons not easily understood, but console myself with the knowledge that they are once again appearing in numbers. In a few weeks they will be all but gone, along with the crowds, as the summer holiday draws to its inevitable close. Oh, come now, it is a perpetual summer in Queensland, compared to the southern states. What you really mean is the pesky crowds of school holiday kids and families will be gone soon. Surely the towels will remain, in lesser numbers maybe, but enough to let people know the Sunshine Coast is an all year round holiday spot!!! matching blue towels eh - not a canal missing under the bridge on Hyde DP2 but a railway line.